You can use any browser with Qualtrics but I find using Firefox works best with Printed Reports. Open up a survey and click on Reports. Choose the layout that fits your needs. I usually choose the second option. 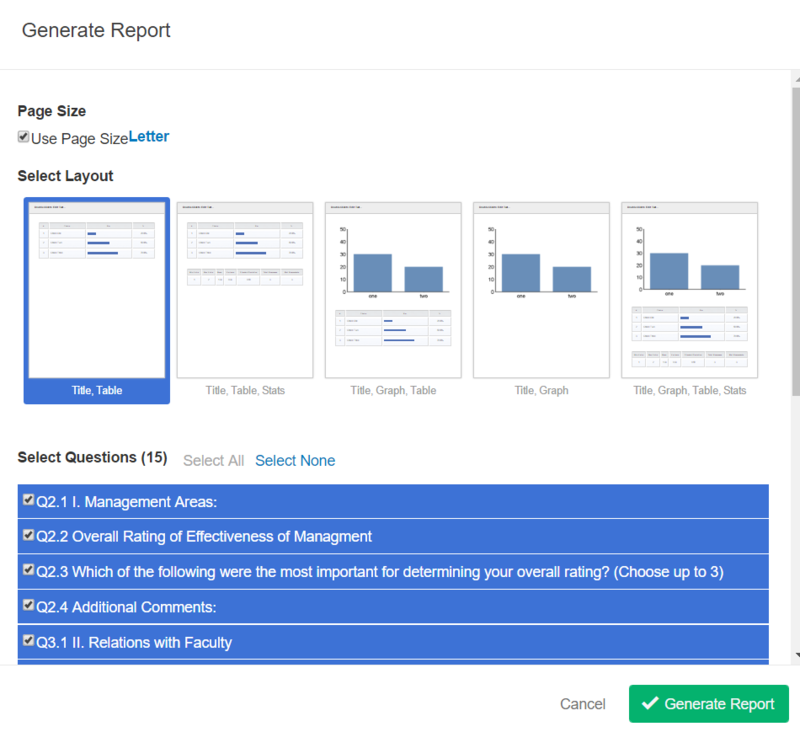 You may also select/deselect questions/embedded that you want to appear in your report. Once you have made your selections click Generate Report. Each question is displayed on its own separate page. If you want to consolidate your report, then you can drag/drop tables on single pages. You may also delete tables that you do not need by simply clicking on the table and pressing your delete key. Open Ended Questions – Once you have your pages set you will need to edit the open ended questions tables (open ended questions are limited to 10 rows per table so this needs to be corrected for each open ended question). To fix this, click on a table and then click Table Options. 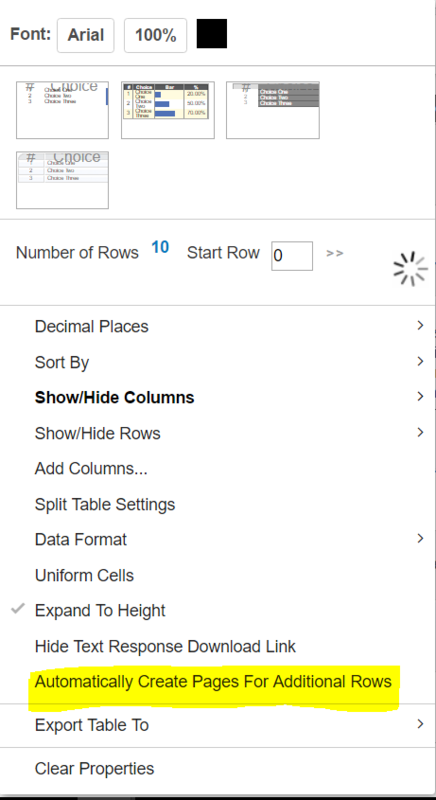 Click the Automatically Create Pages for Additional Rows link then click off to the side. You will not see any changes on this screen but it will create the additional pages when you export the report. You must do this for each of your open ended questions. Filter your Results – now it is time to filter the results for each of your sections. At the top of your screen, click the Add Filter Criteria….. Link. Second drop down box, click on the field name you want to filter – I usually use the Course Section ID. Fourth drop down box, select the section you are filtering for. On the report that displays, click on the Adobe symbol (right hand corner) and it will download to your computer – rename the file and save. DO NOT CLOSE OUT THE WINDOW that displayed your report prior to downloading. Go back to the tab for the Reporting webpage and click Close on the small window labeled Make Report Publicly Visible on the Web. Change the filter to a different section and apply the filter. Go to the other open window and refresh your browser. Your new report should appear. Go to step J and work your way through the process until all reports are created.